Størrelse på denne forhåndsvisningen: 452 × 600 piksler. Andre oppløsninger: 181 × 240 piksler | 362 × 480 piksler | 579 × 768 piksler | 771 × 1 024 piksler | 5 618 × 7 456 piksler. English: "ŒUFS" (Eggs), illustration by Adolphe Millot from Nouveau Larousse Illustré [1897-1904]. See key below for details. Français : "OEUFS", illustration d'Adolphe Millot de "Nouveau Larousse Illustré" [1897-1904]. L'évolution et la sélection naturelle sont à l'origine d'un grand nombre de formes et de couleurs d'œufs. Español: "HUEVOS", ilustración de Adolphe Millot del "Nouveau Larousse Illustré" [1897-1904]. La evolución biológica y la selección natural están en el origen de un gran número de formas y de colores, en cuanto a los huevos se refiere. This file has an extracted image: File:Oeufs002b,01.png. This file has an extracted image: File:Oeufs002b,02.png. This file has an extracted image: File:Oeufs002b,03.png. This file has an extracted image: File:Oeufs002b,04.png. This file has an extracted image: File:Oeufs002b,05.png. This file has an extracted image: File:Oeufs002b,06.png. This file has an extracted image: File:Oeufs002b,07.png. This file has an extracted image: File:Oeufs002b,08.png. This file has an extracted image: File:Oeufs002b,09.png. This file has an extracted image: File:Oeufs002b,10.png. This file has an extracted image: File:Oeufs002b,11.png. This file has an extracted image: File:Oeufs002b,12.png. This file has an extracted image: File:Oeufs002b,13.png. This file has an extracted image: File:Oeufs002b,14.png. This file has an extracted image: File:Oeufs002b,15.png. This file has an extracted image: File:Oeufs002b,16.png. This file has an extracted image: File:Oeufs002b,17.png. This file has an extracted image: File:Oeufs002b,18.png. This file has an extracted image: File:Oeufs002b,19.png. This file has an extracted image: File:Oeufs002b,20.png. This file has an extracted image: File:Oeufs002b,21.png. This file has an extracted image: File:Oeufs002b,22.png. This file has an extracted image: File:Oeufs002b,23.png. This file has an extracted image: File:Oeufs002b,24.png. This file has an extracted image: File:Oeufs002b,25.png. This file has an extracted image: File:Oeufs002b,26.png. This file has an extracted image: File:Oeufs002b,27.png. This file has an extracted image: File:Oeufs002b,28.png. This file has an extracted image: File:Oeufs002b,29.png. This file has an extracted image: File:Oeufs002b,30.png. This file has an extracted image: File:Oeufs002b,31.png. This file has an extracted image: File:Oeufs002b,32.png. This file has an extracted image: File:Oeufs002b,33.png. This file has an extracted image: File:Oeufs002b,34.png. This file has an extracted image: File:Oeufs002b,35.png. This file has an extracted image: File:Oeufs002b,36.png. This file has an extracted image: File:Oeufs002b,37.png. This file has an extracted image: File:Oeufs002b,38.png. This file has an extracted image: File:Oeufs002b,39.png. This file has an extracted image: File:Oeufs002b,40.png. This file has an extracted image: File:Oeufs002b,41.png. This file has an extracted image: File:Oeufs002b,42.png. This file has an extracted image: File:Oeufs002b,43.png. This file has an extracted image: File:Oeufs002b,44.png. This file has an extracted image: File:Oeufs002b,45.png. This file has an extracted image: File:Oeufs002b,46.png. This file has an extracted image: File:Oeufs002b,47.png. This file has an extracted image: File:Oeufs002b,48.png. This file has an extracted image: File:Oeufs002b,49.png. This file has an extracted image: File:Oeufs002b,50.png. This file has an extracted image: File:Oeufs002b,51.png. This file has an extracted image: File:Oeufs002b,52.png. This file has an extracted image: File:Oeufs002b,53.png. This file has an extracted image: File:Oeufs002b,54.png. This file has an extracted image: File:Oeufs002b,55.png. This file has an extracted image: File:Oeufs002b,56.png. This file has an extracted image: File:Oeufs002b,57.png. This file has an extracted image: File:Oeufs002b,58.png. This file has an extracted image: File:Oeufs002b,59.png. This file has an extracted image: File:Oeufs002b,60.png. This file has an extracted image: File:Oeufs002b,61.png. This file has an extracted image: File:Oeufs002b,62.png. This file has an extracted image: File:Oeufs002b,63.png. This file has an extracted image: File:Oeufs002b,64.png. This file has an extracted image: File:Oeufs002b,65.png. This file has an extracted image: File:Oeufs002b,66.png. This file has an extracted image: File:Oeufs002b,67.png. This file has an extracted image: File:Oeufs002b,68.png. This file has an extracted image: File:Oeufs002b,69.png. This file has an extracted image: File:Oeufs002b,70.png. This file has an extracted image: File:Oeufs002b,71.png. This file has an extracted image: File:Oeufs002b,72.png. The original French designation may not correspond to the modern French term. 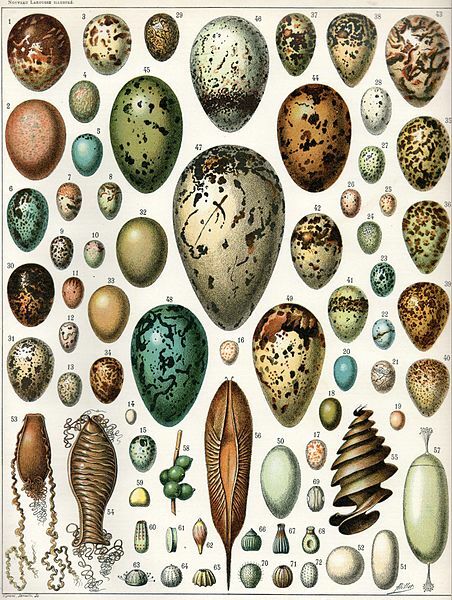 Eggs 1 - 58 are shown reduced in size by about a third and eggs 59 - 72 are enlarged seven to eight times (the whole illustration is about 19.8cm wide by 26.3cm high).